Ananka's Diary: I'll Be Back . . .
That is so cool! It looks like it could be paint, but it isn't, is it? I need ispiration to find something to right on the school chalkboard. Changing the date is getting old! 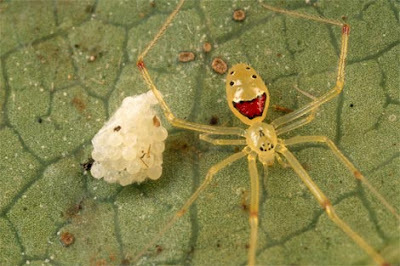 They should have a "smiley face spider" emoticon on IM and email!!! It looks like someone took a Sharpie to it. It's so smiley! I love it! Is it poisonous? Hazel: I don't think so. Or else it's so small that it can't do much damage.